Sophomore Reese Newman scored her fifth goal of the game in overtime Wednesday, lifting No. 13 Thousand Oaks to a 9-8 victory over visiting No. 18 Oaks Christian. The Lancers led 6-4 at halftime, but Oaks tied it early in the second half on goals from Sara Spaeth and Tatum Shore. The teams traded goals from there and went to overtime tied 8-8. Thousand Oaks won the draw to start the extra period and called time out to set up a play, and Newman responded with the game-winner. Freshman Jessica Rickets (2g), sophomore Kailee Pentis (1g) and senior Audrey Byrne (1g) joined Newman in the scoring column for the Lancers, who improved to 5-3 under first-year head coach Mike Ward. Spaeth (4g, 1a) led the Lions in scoring, and Brooke Bryan (2g, 2a), Shore (1g) and Sammi Rudzitis (1g) also scored for the second-year Lions, who fell to 3-3. 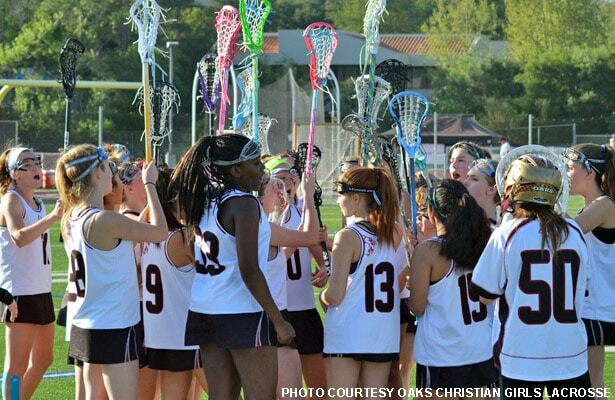 Information provided by Oaks Christian Girls Lacrosse.